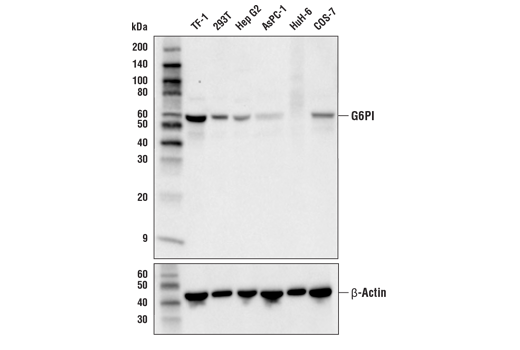 GPI Antibody recognizes endogenous levels of total G6PI protein. Polyclonal antibodies are produced by immunizing animals with a synthetic peptide corresponding to residues surrounding Pro8 of human G6PI protein. Antibodies are purified by protein A and peptide affinity chromatography. Western blot analysis of extracts from various cell lines using GPI Antibody (upper) and β-Actin (D6A8) Rabbit mAb #8457 (lower). Expression levels of G6PI among cell lines are consistent with expectations based on publicly available bioinformatic databases. Glucose-6-phosphate isomerase (GPI) is a multi-functional protein belonging to the glucose phosphate isomerase family (1,2). As an intracellular metabolic enzyme, GPI plays a pivotal role in glycolysis and gluconeogenesis by catalyzing the interconversion of D-glucose-6-phosphate and D-fructose-6-phosphate (3). GPI is also secreted, where it functions as a cytokine (referred to as Autocrine Motility Factor, AMF), acting via the E3-ubiquitin-protein ligase AMFR/gp78 (4). In normal tissues, GPI/AMF has been shown to promote both immune cell maturation and neuronal cell survival (5,6). It is also secreted in abundance by some tumor cells (7), where it has been shown to promote tumor cell migration and metastasis (8,9). Haga, A. et al. (2000) Biochim Biophys Acta 1480, 235-44. Jeffery, C.J. et al. (2000) Biochemistry 39, 955-64. Kim, J.W. and Dang, C.V. (2005) Trends Biochem Sci 30, 142-50. Fairbank, M. et al. (2009) Mol Biosyst 5, 793-801. Gurney, M.E. et al. (1986) Science 234, 574-81. Gurney, M.E. et al. (1986) Science 234, 566-74. Lucarelli, G. et al. (2015) Medicine (Baltimore) 94, e2117. Liotta, L.A. et al. (1986) Proc Natl Acad Sci U S A 83, 3302-6. Funasaka, T. and Raz, A. (2007) Cancer Metastasis Rev 26, 725-35.